Today I'm sharing two cards I created with tiny flower pot gardens on them! For both cards, I started with watercolor paper and lightly painted a blue background across the top with salty ocean distress ink. 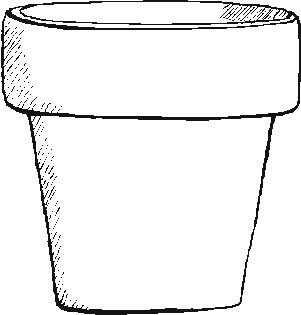 The flower pots came from this coloring page and were printed on dark orange cardstock. I sponge around the edges with rusty hinge/vintage photo distress ink to make them look a bit more realistic. To create my geraniums, I punched a pile of tiny blooms with my scalloped daisy border punch (Fiskars) and glued them to a punched circle. I added a tiny dot to the centers with my white gel pen. For this first card, I also tore some brown paper and added it as dirt across the top of my pots, and added a little garden spider to the corner. I'm not sure how well the picture shows it, but I used my bone folder to bend my pots for added dimension. Power Poppy - Go Ahead -- Bug Me! Wow this is gorgeous! I love that close up view! Thanks so much for playing along with us at The Mod Squad Challenge Angie, Challenge Host. Both cards are lovely, your first flowers look like the ones I bought this year to put in my hanging pots out front, I just used my flower soft the other day for the first time, have to wait to post my card until my sister gets it in the mail, I love how you have used yours, fantastic! Oh my word.. these had to take you hours... great work though so pretty. Thanks for playing in our June Bug challenge at Power Poppy!